The daylily is a beloved ornamental plant whose flowers open in the cool hours of the morning and fade the next evening. Aptly named, the genus Hemerocallis is derived from the Greek for “beautiful for a day.” As an edible, it is prized in Eastern cuisine, but its culinary value is often overlooked in Western culture. All parts of the plant are edible and tasty if prepared correctly, but the buds and flowers add the most flavor and color to dishes. They have a nutty character akin to that of asparagus, and the buds are delicious simply sautéed and served as a side dish. The petals can also be added to salads or used for garnish. Hemerocallis fulva is native to Eurasia and Europe and is one of the original daylily species brought to North America by early European settlers. It wasn’t until the 1930s that a research scientist and educator named Dr. Arlow Burdette Stout began prolifically hybridizing daylilies at the New York Botanical Garden, in the Bronx, leading to the daylily's commercial popularity as a garden plant. According to the American Hemerocallis Society, in 2011 there were more than 70,000 registered cultivars. Using cornmeal in these fritters adds a delicious crunch. Use a fine to medium grind and make sure to use frying oil that has a high smoke point, such as coconut, peanut, or grapeseed oil. Only 3 to 4 tablespoons are used here instead of the several inches you’d use for deep-frying, so use tongs to rotate the fritters to ensure even cooking. Sourdough starter can also be used in the batter for a more complex flavor if you have it, but it is not necessary. If you don’t have mace, you can use nutmeg. This batter also makes an excellent savory griddle cake if fried on its own. In a medium bowl, whisk together the dry ingredients. In a separate bowl, beat together the egg, starter (if using), and ½ cup buttermilk and pour into the dry ingredients. Gently stir. Depending on the grind and age of your cornmeal, the batter should be thick enough for coating but not pourable. Add an additional tablespoon of buttermilk if necessary. Place the oil into a heavy skillet (cast iron works best), and heat over medium flame for 3 to 4 minutes. Test to see if it’s ready by dropping a small amount of batter into the oil. If it bubbles right away, it's ready. If not, wait, or your fritters will absorb too much of the oil and become soggy. 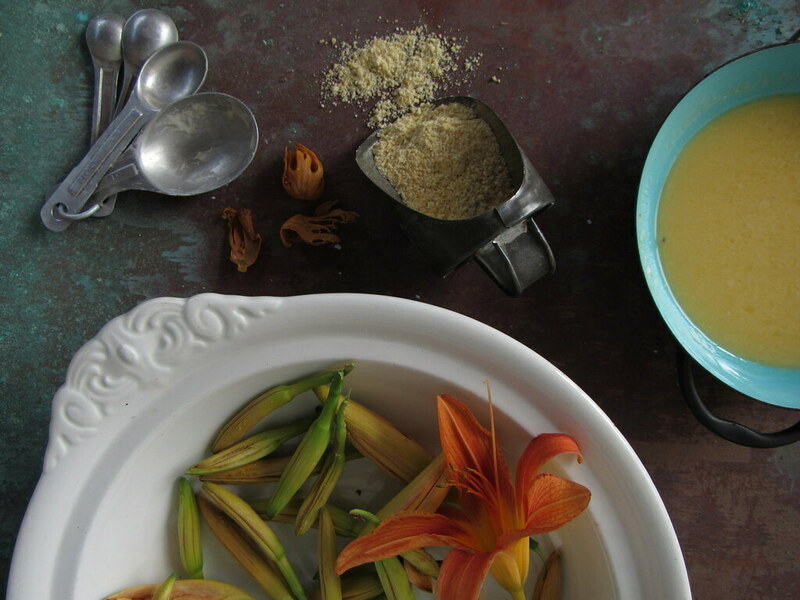 Turn the heat down to medium low and dip the daylily buds into the batter. Quickly transfer to the hot skillet and fry for 3-4 minutes, flipping to ensure even cooking. When the batter is golden brown on all sides, transfer to a paper towel–lined plate to drain. 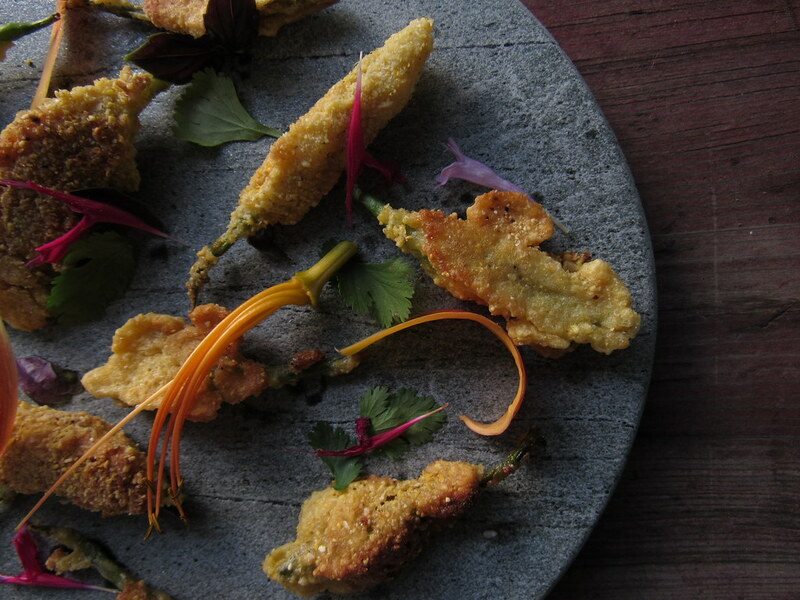 Serve warm, garnished with sea salt flakes, edible flowers, and a wedge of lemon. 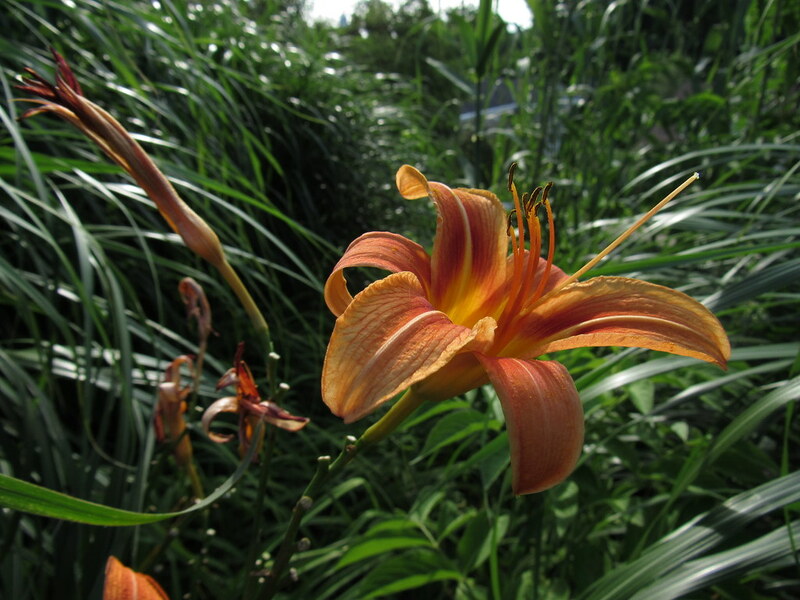 Hemerocallis fulva was one of the original daylilies brought the North America by European settlers. Photo by Sarah Owens.